Nyansa, Inc. (“ni-ans-sah”), a fast-growing innovator of a new generation of network analytics software technology, today reported that the growth of non-traditional cloud-based user application traffic is driving requirements for new tools that help IT staff deal with unanticipated viral applications and their overall impact on user experience and network service quality. Over the last several weeks, approximately six percent of all devices and 15% of all users have accessed the Pokémon GO application at least once on their company networks. Of the top five Web and SAAS applications in use by enterprises, SKYPE™ and Dropbox ™ consumed the most bandwidth across enterprise networks with Box™, Office 365™ and Gmail™ rounding out the remainder. 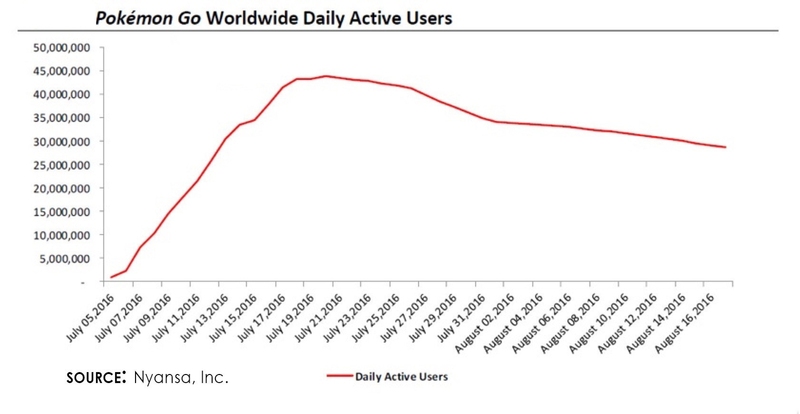 Pokémon GO, which reached 45 million daily active users in just two weeks, highlights how fast network usage can change. The app’s novel use of augmented reality provides a glimpse into a future where users dynamically access network services from multiple mobile devices. These new frontiers in app usage will, however, push the boundaries of today’s computer networks. Nyansa’s analysis of all packet traffic revealed Pokemon GO traffic experienced three times the number of retransmissions than Microsoft Office 365 traffic. This correlates to the different ways in which these apps are used – one on a mobile device while people are moving around the other mainly by users on laptops at their desk. As viral apps stretch the capabilities of today’s networks, Nyansa’s Voyance service brings together data from all layers of the network application stack for every client network transaction. This data is automatically condensed into digestible and actionable summaries that provide IT staff an accurate representation of every user’s application experience, like Pikachu-hunting, in real-time and over time. “Though network traffic from apps like Pokémon GO consume only a small fraction of today’s corporate computer networks, the implications of this sort of trend are profound. IT staff are simply not able or equipped to adequately deal with the pace of technology changes they are seeing from more sophisticated users, devices and applications that all require some sort of reliable network connectivity. We believe a new generation of analytics technology and tools is essential to help solve these problems,” Renault concluded. Palo Alto, California-based Nyansa is a fast-growing innovator of advanced IT analytics software technology, venture-backed by Formation|8, a leading Silicon Valley venture firm. Founded in September 2013 by Abe Ankumah, Anand Srinivas and Daniel Kan, the company employs technology professionals from MIT, Meraki, Aruba Networks and Google, and is credited with developing the first cloudsourced, vendor-agnostic network analytics system, called Voyance, purpose-built for increasingly mobile enterprise network environments. Completely focused on the end user experience, Voyance is the only analytics system that provides cross-company correlation and benchmarking of network metrics and trends. Voyance uniquely extracts, analyzes and correlates wired and wireless data for every user — in real-time and over time — across the entire network-application stack. With Voyance, organizations can now proactively predict problems, optimize their network and justify infrastructure changes based on actual data, radically reducing the time and expense related to optimizing IT network operations from the client to the cloud. More information is available at www.nyansa.com.